Daily Emerald: Governor John Kitzhaber named 14 people with ties to the University of Oregon – alumni, friends, faculty and staff members, and a student -- to serve on the university's board of trustees once confirmed by the Legislature. Portland Business Journal: The University of Oregon endowment has hit a record high on the heels of a $200 million fundraising year. The money will pay for scholarships, athletics, capital projects, faculty and research. The 2012-13 fiscal year fundraising total, the second-highest in university history, included $48.3 million earmarked for the university's endowment. UONews: A review of 126 published research papers on health conditions of native populations in far-northern climates by UO’s J. Josh Snodgrass raises warning flags for the future. 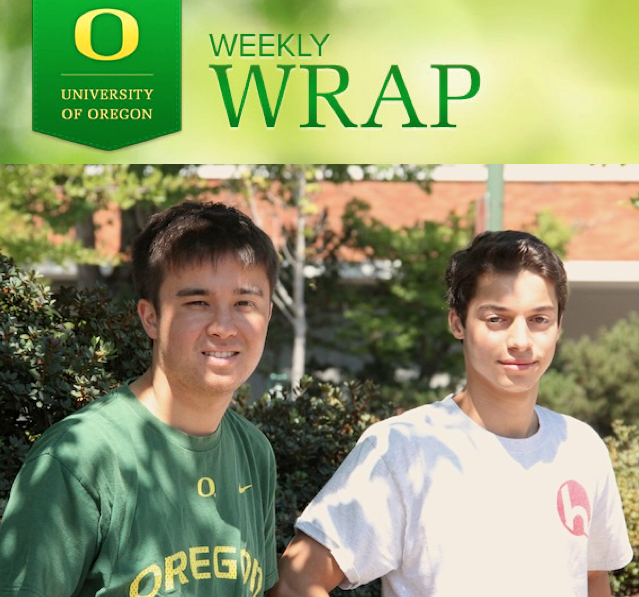 UO Celebrating Champions: Hallspot, a new social media site designed by two UO students, will launch this fall. UO Celebrating Champions: The University of Oregon has been named one of America's Top 25 LGBT-Friendly Colleges and Universities by Campus Pride. AroundtheO: The law school welcomes its newest and returning law students Monday, Aug. 26, for the first official day of law school classes. GoDucks.com: In their final tune-up before the regular season, Oregon volleyball will host an exhibition match against a team of Oregon Alumni at Matt Knight Arena, Friday at 7 p.m.